So many companies nowadays have moisturizers that promise to keep your skin moisturized and smooth. But a few hours later, you catch yourself reapplying your hand/body lotion because your skin feels chapped and dry. Exchange that lotion for a natural moisturizer instead. With fewer chemicals and more body-loving ingredients, a natural moisturizer is most effective. 1. Olive Oil: Olive oil, that’s found in your kitchen cabinets and used to cook with, is an amazing moisturizer. Extra Virgin Olive Oil (EVOO) helps moisturize the skin without clogging pores. It can be applied on damp skin after showering to reduce any feeling of greasiness. EVOO contains Vitamins A and E, which help repair sun damaged skin, air pollution and other environmental hazards. 2. Almond Oil: Almond oil is already a popular ingredient in many moisturizers, but using it in its natural state is ideal. It doubles as a face and body moisturizer that nourishes and promotes healthy skin. Just a small amount of oil is enough to satisfy your body’s needs. 3. 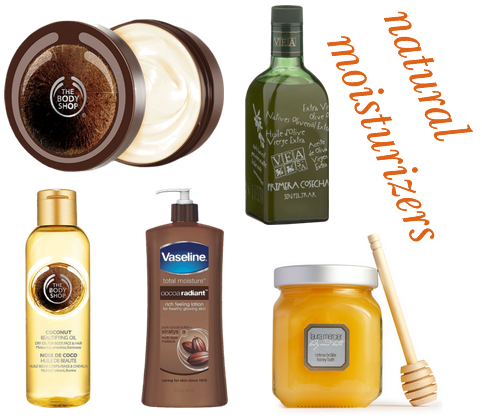 Cocoa Butter: Cocoa butter is another common additive in beauty products that is a natural moisturizer. Cocoa butter melts at body temperature and absorbs quickly. If you have dry skin, then this moisturizer is a good fit. Cocoa butter can be mixed with an oil to double the moisturizing process. It should be used mainly on the body, rather than the face, especially if you are prone to breakouts. 4. Coconut Oil: Coconut oil locks in moisture, lightens scars and smooths out dry, rough areas. Three for the price of one. Coconut oil works for all skin types and reduces the appearance of wrinkles without any irritation. It can also help with skin conditions such as psoriasis, dermatitis and eczema. Coconut oil works wonders on the hair and scalp as an overnight or conditioning treatment. 5. Honey: Honey contains humectants, which draw moisture to the skin. It is also an acne fighter that has antimicrobial properties that will zap away the blemishes. Honey contains antioxidants that neutralize the free radicals responsible for aging. Pure, raw honey is the most effective kind. 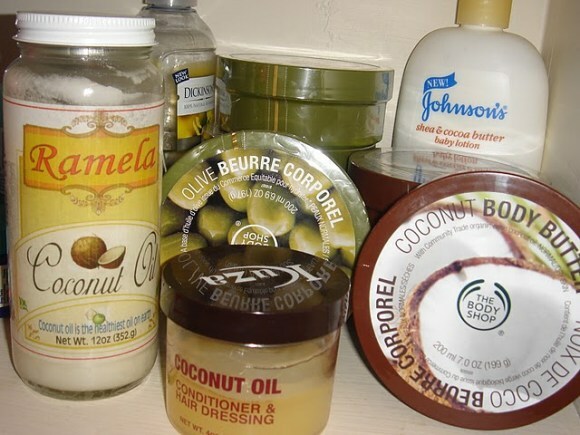 These natural moisturizers can be found in health food stores such as GNC, Vitamin Shoppe and even Whole Foods. Bye-bye artificial, hello natural! If you take care of your skin now, you’ll thank yourself later in life.